The Moodle Reading List add-on provides access to library resources from within Moodle using the Library’s OneSearch research tool. It allows you to easily create readings lists for your courses that link directly to library resources, without the need to obtain persistent URLs, or leave the Moodle system. Step-by-step instructions for adding readings lists to your Moodle pages. The Moodle plug-in uses Learning Technologies Interoperability (LTI) protocol to work seamlessly with Moodle and the Library’s OneSearch tool to create custom reading lists for students. Take a look at the video introduction to the tool below, as well as the step-by-step instructions. For more information or help with using the Reading List tool, contact e-Resources librarian, Nancy Schuler at schulenl@eckerd.edu (x8357). The Moodle Lightbox gallery add-on provides instructors with the ability to add image galleries to their Moodle courses. 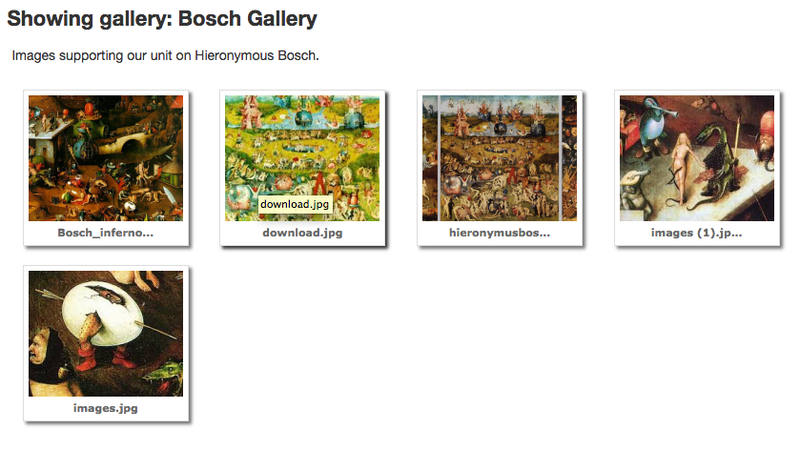 Instructors are able to create, edit, and delete galleries as needed. This is a great resource for showing high quality images from Library databases such as ARTstor, or incorporating images found online, or from your own collections. When students click the link to Lightbox gallery, they will see the gallery page with the thumbnails and associated information for each image. 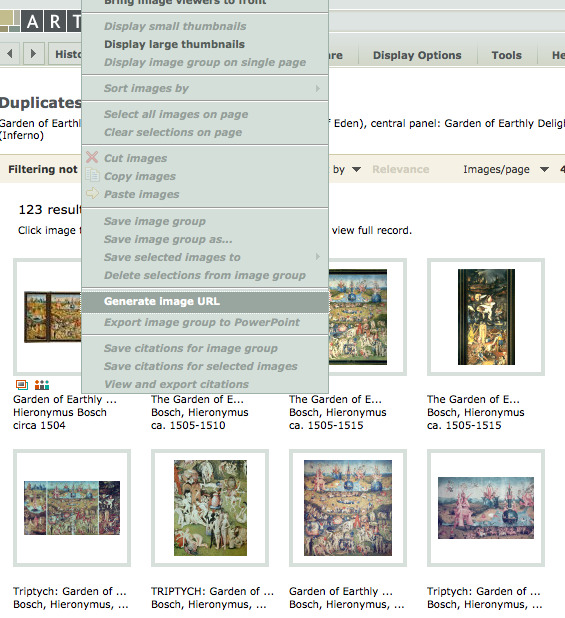 Step-by-step instructions for using the LIghtbox tool to add image galleries to your Moodle page. For more information or help with using the Lightbox Gallery tool, contact e-Resources librarian, Nancy Schuler at schulenl@eckerd.edu (x8357). Kanopy, a streaming video resource offering full-length, institutional access to high-quality feature films and documentaries. Kanopy enables users to stream full-length films, as well as create clips of movies to incorporate into presentations, course websites, and student assignments. Kanopy tutorials. On the video's page, copy the URL of the video from the address bar at the top of your browser and paste it into an email or website. Off-campus users will automatically be directed to login to our campus proxy to access the full site. Overview of linking to video or embedding video within Moodle to help you choose which option is best for your situation. Video tutorial demonstrating how to add link to Kanopy video within Moodle. With this option, students leave Moodle to go to the Kanopy site to view the video. This may be helpful if you want the students to use the video as part of an assignment, for example, making clips, or playlists, as they can take advantage of all the clip-making tools from Kanopy. Video tutorial demonstrating how to embed a Kanopy video into Moodle. With this option, students stay within Moodle to view the video. This allows them to view the video in full screen, but does not give them any other options. If you simply want them to view the video, this is probably enough. Persistent links are permanent or stable links to an electronic article or resource from a library database that will allow a user to access the article at a later time. When linking to resources in library databases, it is best to use the persistent or durable links provided by the database because merely copying the URL will not work, as those contain session information which changes per user. The persistent link will also have our proxy information appended to it, which means that the link will work for both on and off-campus users. 1) Search for an article or e-Book relevant to your course. 3) Click the Permalink button on the right toolbar. 4) Note the Permalink that appears above the article title. Copy and paste this link to your course Moodle page where you would like the article to appear. When your students click on this link, they will be taken to the page above, where they can click on the PDF Full Text link to the article on the left. 1) In any ProQuest database, click on the article title to see the article record. 2) Scroll all the way down to the Indexing section. The persistent link is listed under Document URL. Highlight the link and copy and paste it to your course Moodle page. 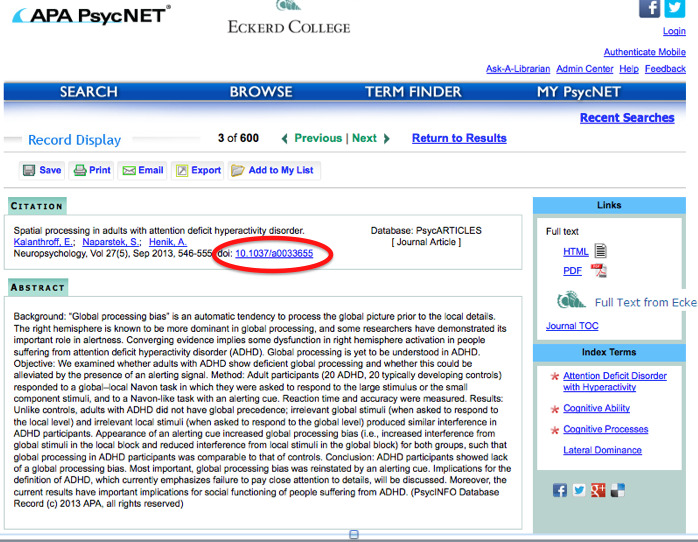 1) In PsycNET, search for an article relevant to your course. 2) Click on the article title to see the article record. 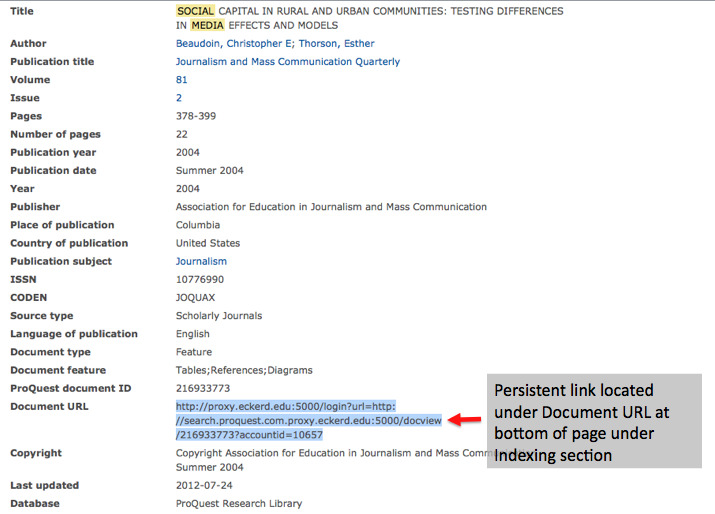 3) In the Citation section, note the hyperlinked DOI (digital object identifier) code, circled in red below. This contains the persistent link for the article. Right click the link to copy the link and then paste it to your course Moodle page. 2) Click the thumbnail caption > select the “File properties” tab. For more information or help with using persistent links, contact e-Resources librarian, Nancy Schuler at schulenl@eckerd.edu (x8357). A multidisciplinary collection of streaming educational videos that touches on the curriculum needs of virtually every discipline. Videos can be easily added to course websites to provide instant access to students. Create custom playlists and video clips for course integration and student assignments. Academic Video Online tutorials. Also see the Quick Reference Guide – Video.